Fans will have opportunity to virtually interact with Charlie Coyle, Jason Zucker or Nordy then receive a digital image of their interaction. SAINT PAUL -- Associated Bank and the Minnesota Wild on Thursday announced that a new augmented reality experience will be available to fans attending Wild games at Xcel Energy Center starting Saturday, Feb. 2 when Minnesota hosts the Chicago Blackhawks at 7 p.m. This new technology will be on display at the Associated Bank Wild Hockey Shots Interactive Photo Experience in section 215. 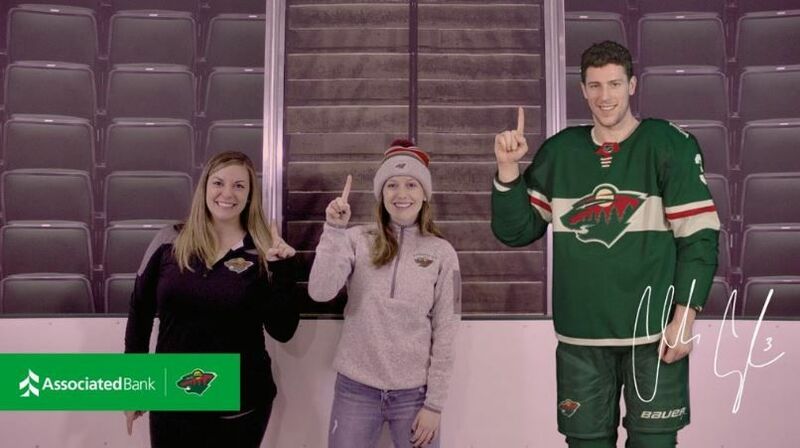 As part of the new augmented reality experience, fans will have the opportunity to virtually interact with Charlie Coyle, Jason Zucker or Nordy and then receive a digital image of their interaction. Fans can then download the image and share the photo on their social media. Associated Bank is also offering fans the opportunity to meet Jason Zucker and Charlie Coyle, complete with dinner, beverages and a Q&A session with the players on Tuesday, March 12, from 6 to 9 p.m., at Jack Daniels Club Old No. 7 at Xcel Energy Center. To enter, visit your nearest Minnesota Associated Bank branch by February 15. For more information, please visit https://www.associatedbank.com/MNWin. Fans can also register to win tickets to an upcoming Minnesota Wild game and an opportunity to ride on the Associated Bank Ice Cruiser by visiting https://www.associatedbank.com/WildTickets through February 28.